While the nation awaits the promised repeal and replacement of the Affordable Care Act, most employer health-plan sponsors have their attention focused elsewhere: health-care costs for employees at large companies are still rising an average of 4% a year, and at this point it’s doubtful the 115th Congress will pass legislation that will curb medical cost inflation. What’s more worrisome to CFOs, though, is that some of the strategies companies have been using for years to keep a lid on health-care costs — such as shifting costs to employees, offering wellness programs, and adding consumer-directed health plans (CDHPs) to the benefits mix — may be nearing the end of their useful life. Cost shifting is becoming less popular because employees may not be able to tolerate additional increases. In years past, a company could get away with raising co-pays by $15 or deductibles by $500, for example. “But if a company now has $1,500 individual and $3,000 family deductibles, it’s hard to continue to increase employee costs,” says Brian Marcotte, CEO of the National Business Group on Health (NBGH), an affiliation of approximately 425 large employers. Wellness programs, meanwhile, have often not generated the returns employers were seeking. That’s because — in spite of participation incentives — most of the employees who join such programs are already health-conscious and generate a tiny portion of medical costs. The good news is that emerging options may offer more cost-control potential than any of the previous methods. Here’s a look at some of the new things companies are trying. The most exciting development in controlling costs is in health-care delivery, where accountable care organizations (ACOs) are evolving into a significant force. 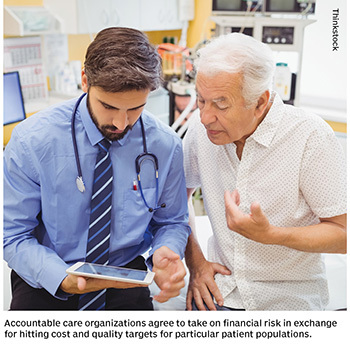 ACOs are groups of medical providers that, instead of charging on a fee-for-service basis, agree to take on financial risk in exchange for a financial benefit if they hit certain cost and quality targets. 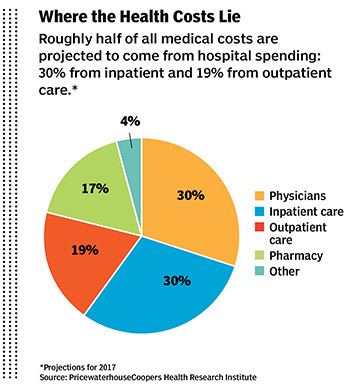 Those targets revolve around particular patient populations for which ACOs provide coordinated care. This pay structure leaves ACOs with little incentive to pad the tab with unnecessary tests and procedures. According to Health Care Blog, the number of ACOs in the United States grew from 64 in early 2011 to 838 in 2016. Meanwhile the number of contracts between ACOs and health-plan providers has increased from about 300 three years ago to more than 1,000 today, notes NBGH’s Marcotte. One problem is that ACOs are in different stages of development and are of varying quality, and it’s not easy for companies to distinguish those differences. Compounding that, ACOs are local organizations, so a large employer with a distributed workforce may have to use several ACOs to cover its employees. To address this, NBGH conducted meetings with employers, health-plan providers, and medical providers to determine which ACO competencies are most important. The result was a “journey map” checklist that includes desired capabilities for ACOs of different maturity levels. NBGH also created a scoring guide to enable consistency when evaluating different ACOs. Altogether there are about 10 broad areas of competency, including the use of electronic medical records to track patients’ history and needs, and 24/7 access to urgent care facilities. With good intentions, most companies offer an assortment of programs and services designed to help employees become and remain healthy. These may include weight-loss and smoking-cessation programs, second-opinion services, and mental-health counselors, among others. “When there are many different programs, employees often don’t know how to use them, [let alone] maximize their benefits,” says Michael Thompson, CEO of the National Alliance of Healthcare Purchaser Coalitions, an umbrella organization for about 50 employer coalitions. Additionally, people tend to engage with health care only when they need it. “If you suddenly have an issue, you talk to a medical professional, he tells you what to do, and you do it,” says Eric Krieg, president of Risk International Benefit Advisors. Most of the time, people aren’t stopping to think about whether they’re taking the best route, what the implications of their actions are, or what other options might be available to them, he adds. A surprisingly simple but effective antidote for those scenarios has been gaining in popularity over the past few years, though: creating what Thompson calls a “hub of support.” The most successful of these have been “interpersonal hubs,” in which an employee calls a single number for any health care-related issue. The first time an employee calls, even if it’s for something simple like ordering a new insurance card, he or she is assigned to a specific health coordinator. That person will remain the employee’s advocate for all future inquiries and can help him or her navigate through all the health options the company offers. “These individuals build enough trust with employees that they get to know the issues in their lives,” says Thompson. “The result is that engagement rates might be four times higher than what happens with typical consumerism strategies.” The advocate also steers plan members to value-based providers and otherwise looks to hold costs in check for both employee and employer. 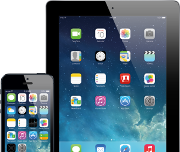 The service is often provided by a third party under a contract with a health insurer. The best-known third parties are Accolade and Quantum Health. Among the employers that recently began offering such a hub is pharmacy chain Walgreens Boots Alliance. In this case, though, insurers are directly providing the servics for two of the three Walgreen health plans included in the program. The voluntary program, which launched on January 1, 2017, is available to about 110,000 U.S. members of three Walgreens health plans. Among participants in the company’s largest health plan, 55% of those who required care in the first quarter engaged with a health coordinator. “For a brand-new program, that’s pretty great,” says Thomas Sondergeld, Walgreens’ vice president of global benefits. Is it possible to calculate the financial benefits of such a program? 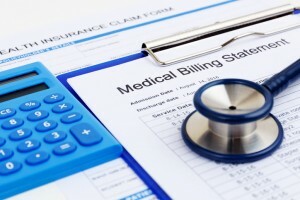 According to a 2016 opinion letter by an independent actuary, Michael Taggert, formerly with Aon Consulting, in the first year of participation companies in one program experienced an average of 8.6% lower medical cost inflation than the market trend. Over time, the letter claimed, a company can cut medical cost inflation to between one-third and one-half of the market trend. Some companies have conducted tests before commiting to an interpersonal hub, making it available to half of the employee base while the other half continued with the traditional approach, according to Thompson. “What company after company found is that costs flattened out and in some cases dipped,” he says. Genetic screening may be a tantalizing idea for saving on employee health-care costs. It can, for example, identify who’s at risk for various types of cancer. Such employees can then undergo more intensive testing to search for cancer and catch it early. Few employers have chosen to entertain the idea, though. Under two current laws, the Genetic Information Nondiscrimination Act and the Americans with Disabilities Act, employers can’t even ask workers to undergo genetic testing, let alone require them to. A Republican-sponsored bill introduced in March 2017, the Preserving Employee Wellness Programs Act (HR 1313), seeks to end that regime for employers that offer wellness programs — despite significant public sentiment that mandatory genetic testing is an unacceptable invasion of privacy. The law would allow employers to charge workers up to a 30% higher premium if they refuse the testing. That’s the same mark-up that employees can be assessed under the Affordable Care Act for not participating in a wellness program if their company offers one. The bill was passed along party lines by the House Committee on Education and the Workforce. Its momentum has been stalled, though, following strenuous resistance from privacy advocates and the Equal Opportunity Employment Commission, which has consistently taken positions against wellness programs. 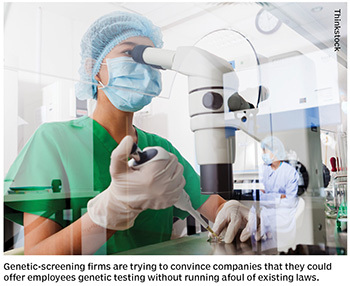 Genetic-screening firms are trying to convince companies that they could offer the option within their wellness programs without running afoul of existing laws. Still, it’s unclear whether even strong participation by employees would actually generate significant savings for health-plan sponsors. “You can’t consider only the cost for the one person who had pancreatic cancer and was cured with a straightforward operation, versus the person who had the operation but still ended up incurring hundreds of thousands of dollars in medical expenses before dying,” says Levin-Scherz of Willis Towers Watson. “You also have to think about all the other people who might be found to have the pancreatic gene,” and consider their potential medical costs. They would get $1,000 to $2,000 worth of screening every year for the rest of their lives — and some of them might be found to have other conditions that could lead to expensive operations. Not that there’s anything wrong with prioritizing employees’ health above additional costs, of course. It’s just a matter of understanding all the variables, Levin-Scherz explains. Retail health-care service providers that market themselves to patients as convenient and typically low-cost are also helping companies control expenses. The providers in this “direct care” model can make it worthwhile for employees to pay out of pocket and bypass insurance. Single episodes of care might be priced at $79 or $99. Originally focused on the individual market, direct care is gaining traction among self-funded employers and the third-party administrators of their health plans, says Harry Nelson, managing partner at law firm Nelson Hardiman, which has helped multiple health-care providers set up direct-care practices. Although direct-care services started out offering mainly primary care, employers and TPAs are now contracting for low prices with providers of other services they know they’ll need in abundance, such as physical therapy and chiropractic care. Direct care is different from urgent care, which serves patients who have non-life-threatening conditions that need immediate treatment. “[Direct care enables companies to avoid] specialty costs by creating an earlier pathway to nurses, physical therapists, and chiropractors,” Nelson says. TPAs, in particular, are driving much of the growth in direct care. While insurance companies themselves offer TPA services, many self-funded companies use stand-alone TPAs. Market leaders include Sedgwick Claims Management Services, Crawford Advisors, York Risk Services Group, Gallagher Bassett, and UMR. “A few years ago, you didn’t hear about TPAs directly contracting with medical providers,” Nelson says. But, he adds, they’ve identified savings and profit opportunities for themselves. Instead of paying in-network rates established by health plans, they’re cutting out the middleman and getting lower prices for core medical services. There’s been little coverage of the trend in health-care media, “but it’s a source of pricing pressure [on insurers], so I think you’re going to see more of it,” says Nelson. ACOs, interpersonal hubs, genetic screening, direct care — in the absence of regulatory and political actions, the market continues to devise new ways of coping with higher employee health-care expenses. It will be up to individual health-plan sponsors, though, to find the strategies that work best for them. 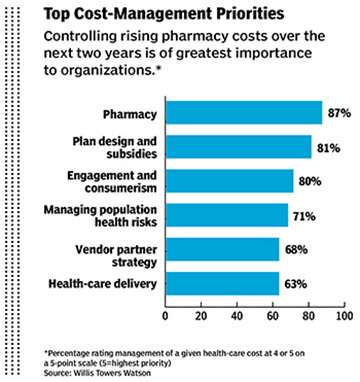 To optimize health-plan management, it’s often necessary for the CFO to be involved. CFOs may prefer to leave benefits management to the benefits people, but if they are serious about holding down health-care costs, they might want to keep an eye on those folks. Consultant Eric Krieg says the first things he looks at when appraising a new client are the priorities of the people assigned to manage the company’s health plan. Too often he observes a self-interest on the part of benefits managers that hinders the optimization of plan management. On top of that skittishness, many benefits managers have little or no upside within their compensation structure as a reward for taking a positive step, Krieg notes. So if a change will create more work or require them to do something differently, they may not be motivated to implement it. 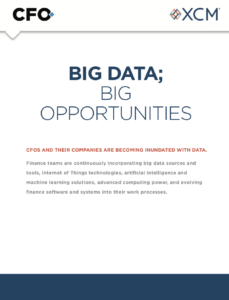 That’s why it’s important for CFOs to be engaged in health benefits. “When I talk to senior finance people, I want to make sure they’re not getting a filtered view of what plan-management options are available,” says Krieg.